If you have any questions about PlayoutONE then hopefully you will find the answer here. If not then you can always get in touch via our contact page. What’s Included With My License? When you purchase a PlayoutONE license you’ll receive 1 license code to run PlayoutONE on 1 PC. Should you wish to run PlayoutONE on two PCs then you’ll need to purchase Two Licenses. Your PlayoutONE License also covers Monitor. To use FileCopy, Surface, LiveStream, Auto Importer and Remote VoiceTracker in their full capacity you’ll need to purchase specific licenses for those products. Without a license these products run with limitations. All these license can be purchased separately or by purchasing our PlayoutONE App Pack. Contact our support team for more details. All PlayoutONE Software Licenses come with 30days support. After that you’ll need to purchase a support subscription for each of your PlayoutONE licenses. More details can be found here. We have thousands of happy customers and those that have needed to get in touch get responded to usually in a matter of minutes if not hours. We offer free support for 30 days after your purchase. We then encourage you to sign up to our support subscription which is less than the price of a round of drinks! Can I control the envelope volume points on audio? You can’t set and draw your own custom volume points, but in the Segue Editor you will visually see the points where the automatic volume points are. PlayoutONE makes it easy to set various thresholds for volume, fades and even automatic ducking. Volume Ducking can be set to be automatic over voice tracks and other production. 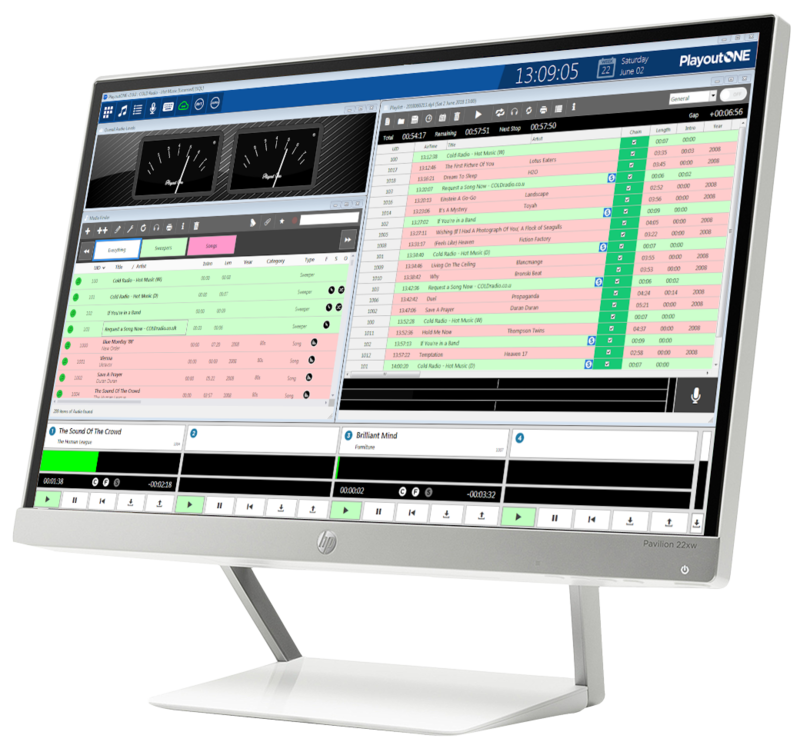 This makes producing shows even faster with users reporting a 90% time saving. Yes, ASIO is supported in PlayoutONE. You simply need to choose to enable it in the settings and then restart PlayoutONE. You will then be able to set the devices and channels you require. Can I import from other systems? Yes. As long as you have already exported the data from another system then you will be able to import using our universal importer. You can analyse the file and map PlayoutONE fields to those of the data file. Can I take a live audio feed, like news, and mute and unmute it through PlayoutONE? Yes. You can set a live device to feed through your system and then when you wish to mute it or let it through you can do so by using commands in the PlayoutONE playlist. Can I pull in a file or stream from the internet and play it? Indeed you can. Using the commands in PlayoutONE you can load and play streams. If the file resides on the internet you can load it up in advance and play it when you need it. This is ideal for news bulletins and the like. Can I use an external scheduler to generate playlists? Yes, as long as they can output the necessary file that PlayoutONE requires for playlists. Our recommended scheduler is Music1 SE which not only exports to the correct format for PlayoutONE but also synchronises audio details. Music1 SE can also be purchased on a buyout so you can have the full power of a commercial radio station for a fraction of the cost. How much can I refine the AutoDJ templates? In addition to the Title and Artist rotation values of the individual types you can set templates to choose based on type and / or category so you can really get specific when it comes to audio selection. That said the AutoDJ is only a basic selection system but it still is a very powerful feature. Can I just leave PlayoutONE playing without making any playlists? Yes. Using the AutoDJ you can design templates for selecting audio and then switch it on. Audio selected obeys Title and Artist rotation values which you set for each type. So for example an item type Song could have a Title rotation of 20 minutes and an Artist rotation of 60 minutes whereas the item type Jingle could have a Title rotation of 10 minutes but an Artist rotation of 1 minute. Switch on the AutoDJ and PlayoutONE will intelligently loop through the selected template to choose the audio to play. Is there a log of played audio? Yes. All audio played is logged and a full history of individual audio items can be inspected. This can be turned off if you do not require this. Does the playlist support commands? Yes. To facilitate complete automation playlists can be switched, loaded and generated from commands inserted into the playlist. Does PlayoutONE allow me to rip from CD? Yes. CD Ripping is fully supported and any meta data that may be available will be automatically populated for you. Does PlayoutONE have a living log like DARP NG? No. PlayoutONE doesn’t have a living log it works on playlists. These playlists can be built by either generating them automatically or by dragging and dropping audio. What audio file types are supported by PlayoutONE? What is the minimum recommended specifications? Operating System: Windows 7 SP1 or later, and all available Windows updates. Hard Drive: PlayoutONE needs around 1gb of space to operate. You then need enough storage on your hard drive for PlayoutONE to make a copy of each file you import. We therefore recommend at least 1TB of storage space. Please note Mac OS is not supported however you may re-create identical specifications using VMWare or something similar at your own discretion. Does PlayoutONE output audio to multiple devices? Yes. We have designed PlayoutONE with 4 on screen players and each player can output to any audio device on your machine. There is also a 5th device which is for editing and previewing audio this can go through it’s own device as well. You may want everything to go through just one device – this is also supported. PlayoutONE 2.1 also supports 7.1 Surround Sound cards. So you can have multiple outputs from a simple sound card without spending hundreds on a multi headed sound card. Will PlayoutONE run on a MAC OS? Not at the moment. PlayoutONE is for Windows and is supported on modern Windows OS’s like 7, 8 and 10. XP & Vista is NOT supported.